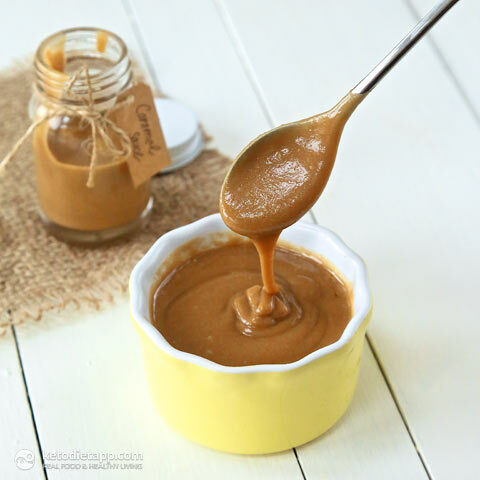 Making a really good caramel sauce that is sugar-free is not easy and I can&apos;t take credit for this recipe. 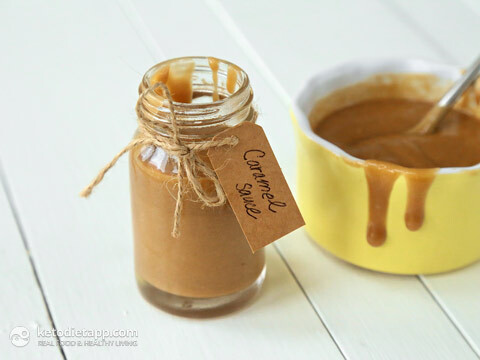 Carolyn of All Day I Dream About Food has spent a long time developing and fine-tuning this amazing Caramel Sauce that tastes and looks just like the real deal. Glucomannan powder is made from konjak root just like shirataki noodles. I used it for thickening. You can also use xanthan gum instead just like Carolyn did. Although xanthan gum is one of the ingredients that may not be considered paleo/ primal, small amounts won&apos;t cause any harm (provided that it doesn&apos;t upset your stomach). Sukrin Gold is a natural low-carb sweetener made with erythritol, tagatose, glycerol (glycerine), malt extract (gluten-free) and steviol glycosides. 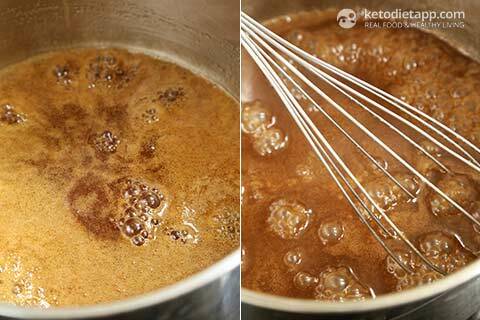 It can be used just like brown sugar and is perfect for making low-carb caramel sauce. Glycerine is a simple polyol (sugar alcohol) that is made either from plants or from animal fat. 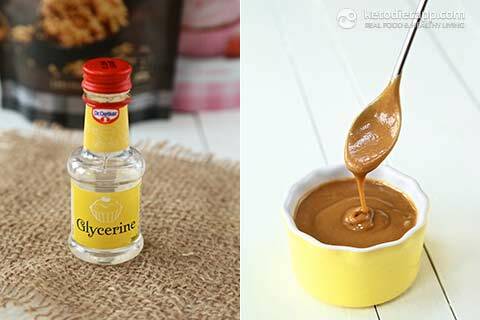 I used glycerine to make the caramel sauce smooth and prevent sweetener crystals from developing when it&apos;s chilled. It has a minimal effect on blood sugar but I would still use this ingredient with caution and count at least half of it as carbs. You can find more about glycerine here. Note: Erythritol-based sweeteners including Sukrin and Swerve do caramelise when chilled so keep that in mind. Adding vegetable glycerine helps the caramel retain a smoother texture. 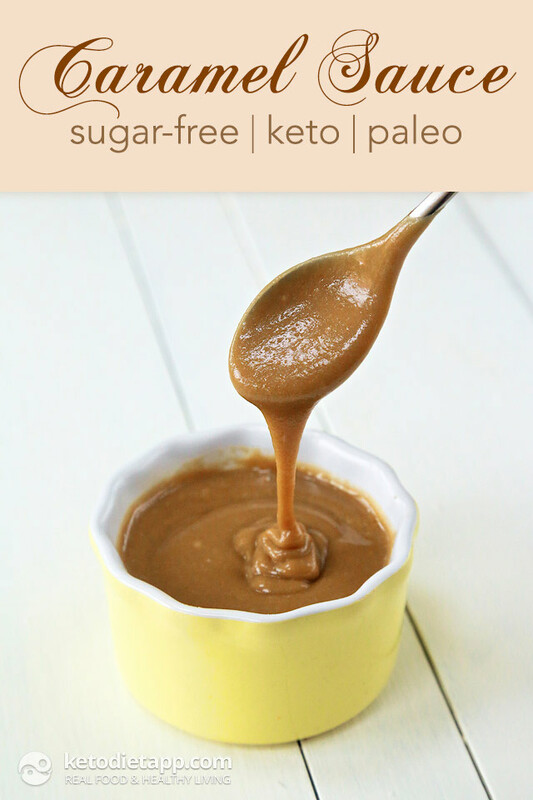 For super smooth caramel you can use allulose instead of the sweeteners listed. 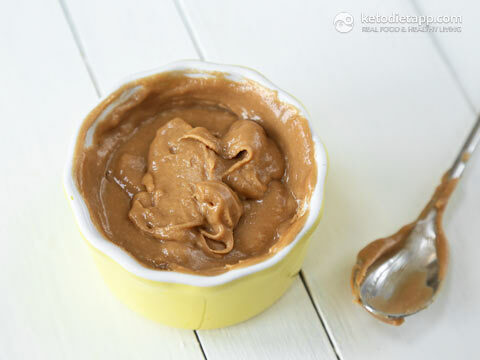 For this recipe you&apos;ll need Sukrin Gold natural brown sugar substitute and glucomannan powder that is made from konjak root. You can read more about these ingredients in the intro. 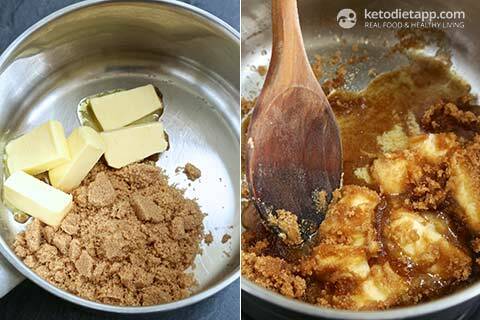 Place the brown "sugar" and the butter into a medium sauce pan. Bring to a boil over a medium heat and cook for about 5 minutes. Keep stirring to prevent the mixture from burning. Mix the glucomannan powder with 2 tablespoons of water by sprinkling it on top and mixing until no clumps are visible. In a small bowl, combine 1/2 cup of coconut milk and the glucomannan powder mixed with water. Do not make the same mistake I did. I mixed the powder directly with the coconut milk and then had to blend the caramel sauce as there were clumps of the gelled powder in it. Remove the butter and sweetener mixture from heat and mix in the coconut milk & glucomannan blend. Mix vigorously until well combined. The mixture will start to thicken. Return to the heat and cook for another minute or two while stirring. Take off the heat and mix in the salt (a pinch or more to taste). 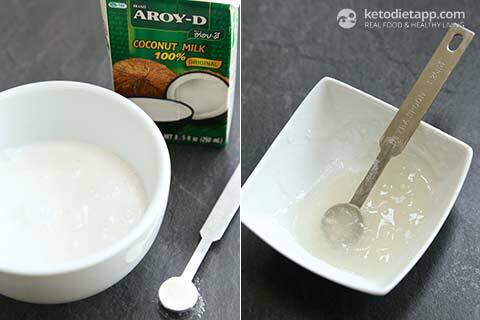 Let it cool down for at least 5 minutes and then mix in 2 more tablespoons of coconut milk and combine well. For a smoother texture and to prevent the sweetener crystals from forming as it chills down, add a tablespoon of glycerine and mix until well combined. At first, the caramel will be thin and runny but it will thicken as it cools down. Place in an airtight container and store in the fridge for up to 2 weeks or freeze for up to 3 months. This is how it becomes when chilled in the fridge for an hour. If you use glycerine, the texture will be smooth - if you don&apos;t use it, you will see sweetener crystals. You can make it smooth again by heating up! 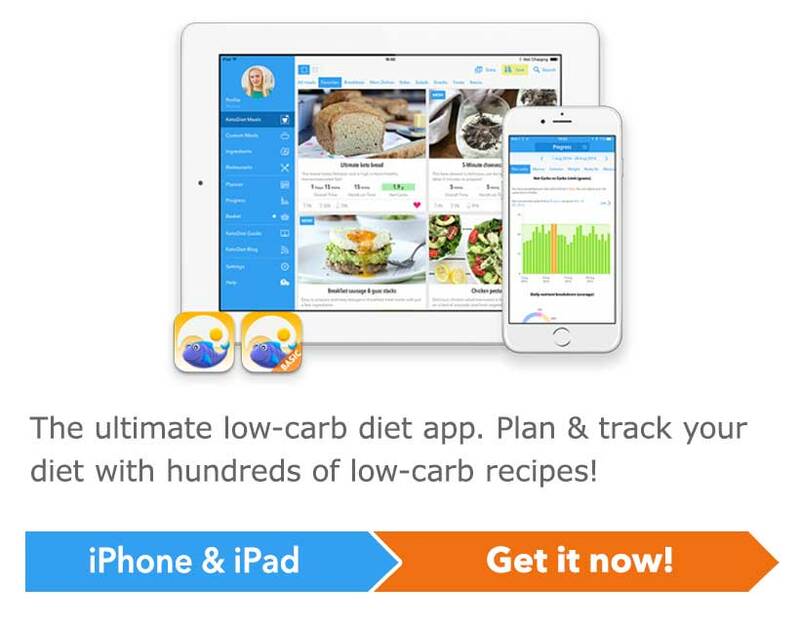 Hi Sonia, arrowroot may work but you'd have to use more of it. It depends on how you plan to use this sauce but it may be better to just skip it. Hi... I managed to get xantham gum from a store that supplies to hotels. 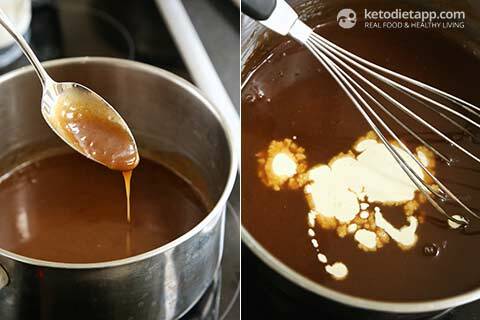 How and when do I mix it while cooking the caramel? In the recipe you have only given instructions for glucomannan. Thanks. Hi Sonia, I would use it just like the glucomannan powder (step 3) as these two are very similar. Ideally, mix with some water to avoid any clumps. Even if you get clumps, use an immersion blender and process until smooth. I hope this helps! Can I get Sukrin Gold in Canada? I think you should be able to find it on Amazon (should be available at Amazon.ca) or get it directly from Sukrin's website. 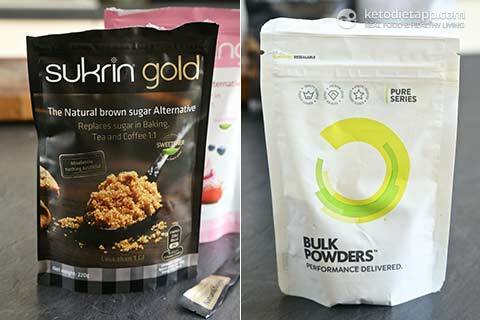 Though it would alter the taste, could I use erythritol instead of sukrin gold? Yes you can. The brown sugar substitute adds flavour and colour but you can try a teaspoon of blackstrap molasses + Erythritol for a similar effect. Could I use xanthan gum instead of glucomannan powder? And do you think it would be 1:1 ratio? Hi Christian, yes, you can. This is delicious, it really tastes like caramel! I didn't use the same sweetener because I only had erythritol and a tablespoon of blackstrap molasses... it was perfect! Thank you Megan, glad you liked it! Wow, this took some serious creativity! I'm always impressed with recipes like this. They're the most labor intensive but result in the best food! Both you and Carolyn are awesome! !